Although I was going to do the third part in my 'Mattes Up Close' series I figured I'd take a breather for a bit as those big blog articles are quite a job to put together, and I do have a number of semi-prepared one off blogs which have been sitting on the back burner for a while now. I'll still publish that Up Close blog though I'll clear the decks of some other pressing retrospectives first. 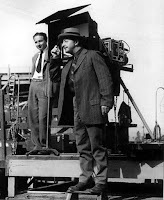 Among the films I' ll be focusing on will be three major effects shows from MGM - all of which were celebrated showcases for studio legends A.Arnold Gillespie and Warren Newcombe. 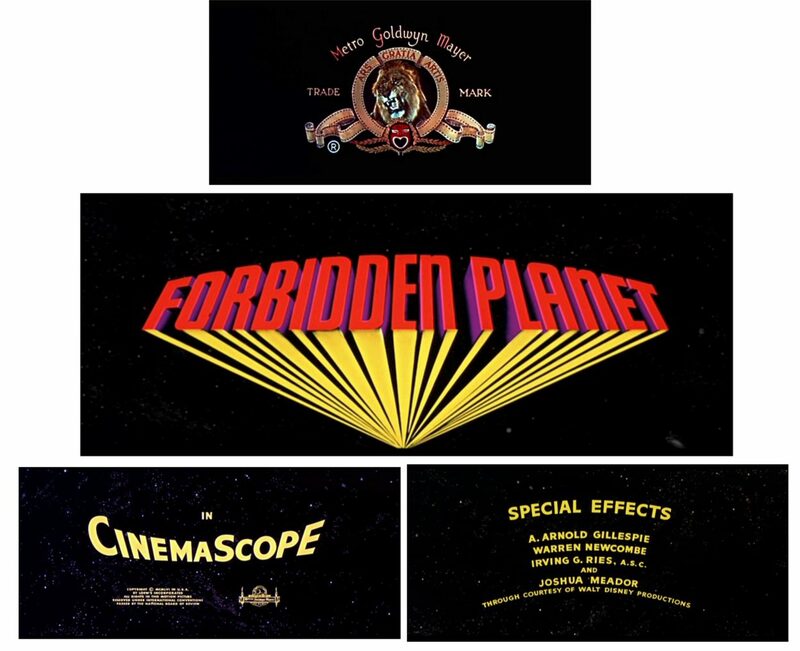 First up will be a look back at the effects work from the 1955 FORBIDDEN PLANET which have made that film so endearing to legions of fans the world over. Following this I'll do a retro on one of my all time favourite war films, the brilliant 1944 visual effects Oscar winner 30 SECONDS OVER TOKYO and finally the over looked 1940 Clark Gable-Spencer Tracy oil drilling actioner BOOM TOWN, which is in a class of it's own effects wise, though lost out in the Oscar that year (and, no...I'm not grieved, as shocking as that may read to some, as that was THE toughest collection of competitors ever that year). 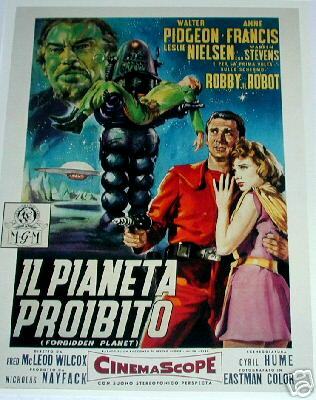 so on with the blog.......The visual effects of FORBIDDEN PLANET...William Shakespeare in outer space. 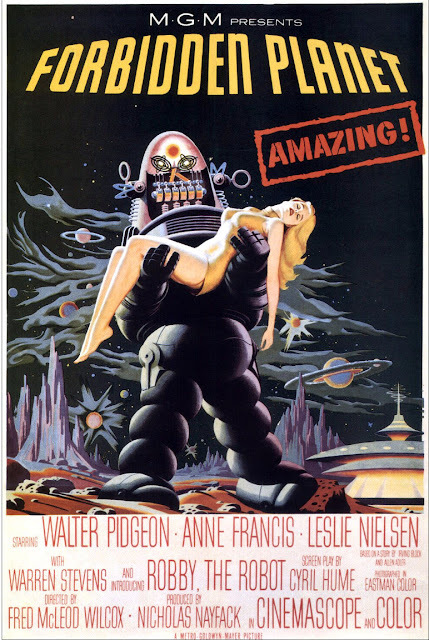 I've got several thousand old movie one sheets and lobby cards in my basement, with my FORBIDDEN PLANET original being the best of the lot I'd say... they don't produce movie ad art like this anymore folks. 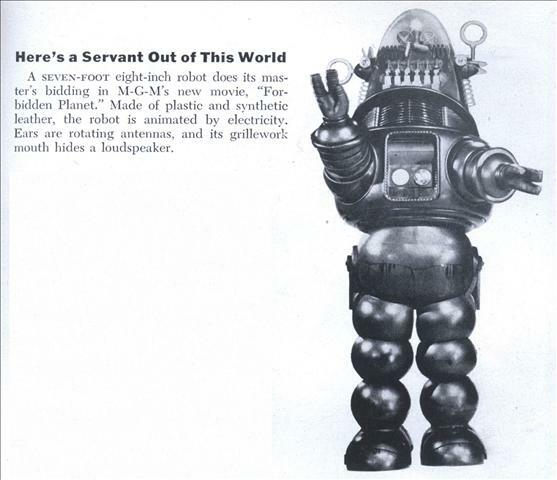 Popular Mechanics of 1955 profiles a popular robot! The film FORBIDDEN PLANET was to a large extent a peculiar merging of the talents of England's best selling 16th Century quill penned novelist William Shakespeare and 20th Century matte painter Irving Block - a more curious set of bedfellows you'd be hard pressed to find. What is evidently Shakespeares The Tempest was updated - seriously updated in fact, into a science fiction future far removed from what Willy ever would have imagined. This science fiction re-imagining was largely the concept of both Irving Block and Allen Adler. Block was a long time matte painter with Fox and MGM before branching out as an independent effects concern in the early fifties with partners optical fx cameraman Jack Rabin and title artist Louis DeWitt. I have my own theory, albeit an arguably off the wall one as to FP's origins, and I'll discuss this at the end of the blog and eagerly await responses from historians, academics and sci-fi buff's alike. Exterior plate pre-Newcombe dept's Krel painting. Part of the success, which as far as I'm aware was not immediate and took decades to be realised, was due to the wonderful look of both the alien world and it's vast sub-terranean machinery, but also the screens' newest and, until a later sensational Irwin Allen tv variation, it's Robot - affectionately known as 'Robby'. I'm an enormous fan of MGM special effects chief Buddy Gilespie's work - with a mammoth virtually exclusive Metro Goldwyn Mayer career which stretched from around 1925 in the art and title department to his assignment as chief of all physical, miniature and process projection effects at the studio in 1936 - from which time Buddy was involved with hundreds of pictures for the studio - with as best I can verify THE GREATEST STORY EVER TOLD probably being his last credit. Buddy's multiple talents also extended into cartoon animation for the studio as I found out by accident just the other day. where his name cropped up in the credits of an old cartoon. 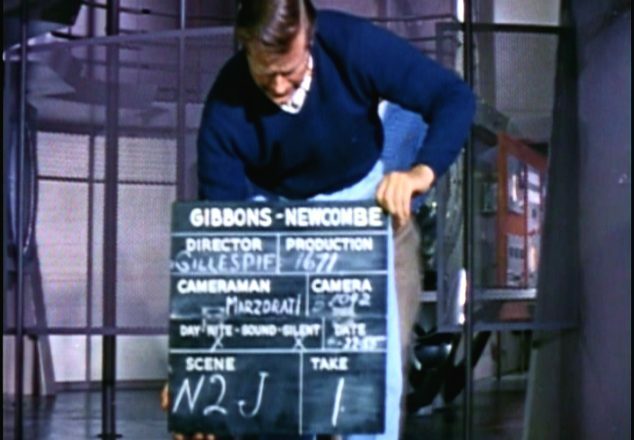 Gillespie passed away in 1978 with an armful of Oscars amid his numerous accolades. Working alongside Gillespie was his long time partner, the Austrian born miniatures cinematographer Maximillian Fabian, who had been with the studio for more than twenty years at this point, having photographed the stunning miniature scenes of destruction for James Basevi and Gillespie on SAN FRANCISCO in 1936, the jaw droppingly realistic bomb run set piece for 30 SECONDS OVER TOKYO (1944) and similar flaming conflagrations with Buddy and Donald Jahraus on Mervyn LeRoy's epic QUO VADIS in 1950 - three amazing high points in Fabian's long, celebrated career. 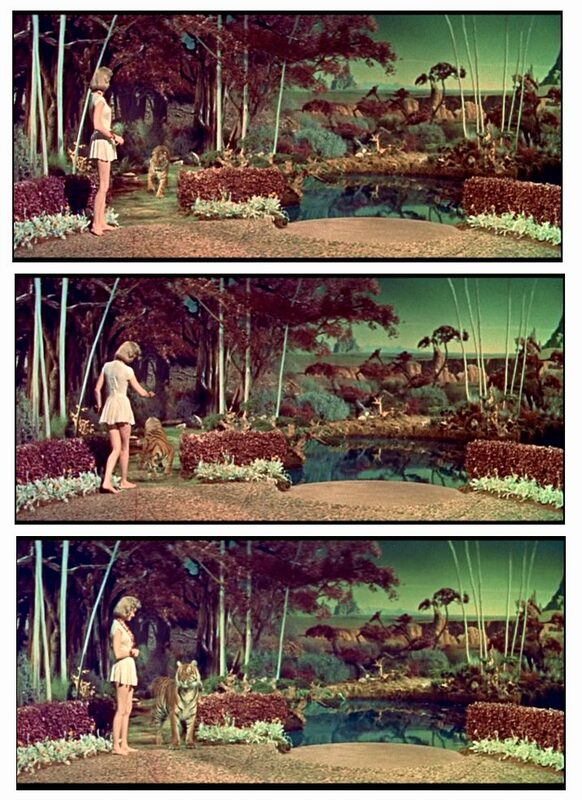 I've written often about matte supervisor Warren Newcombe so I won't retrace all of that, except to say that although the matte work here is serviceable and features at least one of cinema's most memorable shots it's in no way the best representative work from the iconic Newcombe department in my opinion. 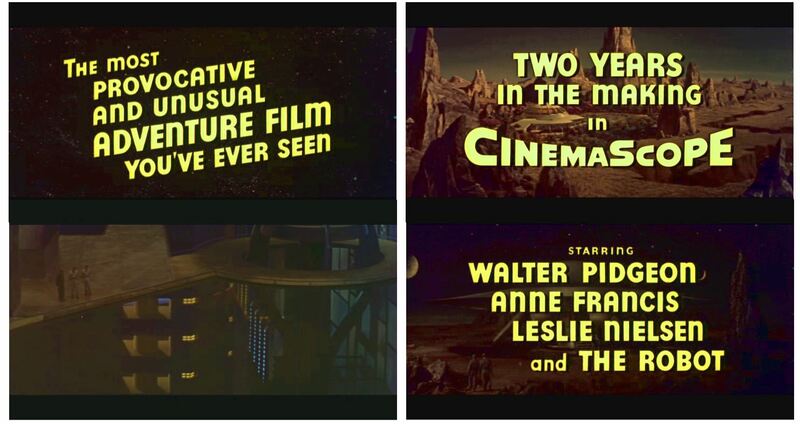 A trio of matte artists painted on FP under Newcombe - Howard Fisher, Henri Hillinick and Matthew Yuricich -and I'll go into some detail later as to their contributions as best I can. 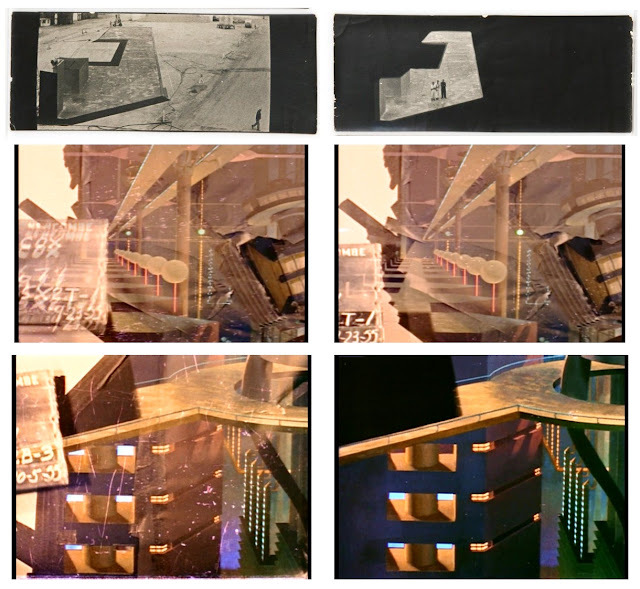 At right are two rather faded 35mm test frames showing Newcombe matte shots of the living quarters and adjacent graveyard on Altair IV so central to the plot . 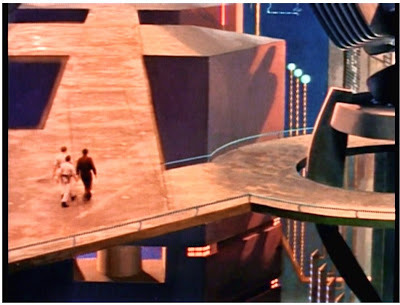 As an interesting sideline to Newcombe's headship of the matte unit, Irving Block, who himself was a matte painter under Newcombe at one stage said in a 1979 interview in Cinefantastique: "Warren never touched a brush...He was my friend and I worked for him, but Warren Newcombe never did anything. 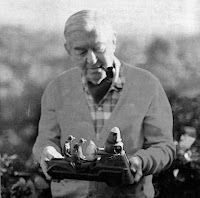 He sat in his office and played around with his shortwave radio calling his friends to play chess"
The photo at left is taken from Craig Barron's indispensible chronicle The Invisible Art - The Legends of Movie Matte Painting, and shows Newcombe (foreground) with long time cameraman Mark Davis posing against their matte camera set up. The film was up for the effects Oscar against John Fulton's THE TEN COMMANDMENTS - and while that's a tough choice I'd probably go with the Fulton film for the arguably astonishing Red Sea set piece - matte lines and all, as it was an amazing engineering and photographic achievement with more optical tweaks than all of FORBIDDEN PLANET put together. I fully expect some criticism here of my choice naturally. Of note for being one of, if not THE first films to feature an entirely synthetic score with the catch being that the composer/arranger partnership of husband and wife team Louis and Bebe Baron were inelegable for a 'music by' credit and had to settle for 'electronic tonalities by' instead. One of the three Gillespie's spacecraft miniatures beautifully shot by veteran MGM model effects cinematographer Maximillian Fabian to stunning result in CinemaScope. One of the best one off shots of the genre this one. Rare frames from unused Gillespie planet effects tests with a strikingly well made planet. Some more FP planet tests by Buddy Gillespie and fx cameraman Maximillian Fabian. Effects slates and publicity stills of one of Gillespie's saucer miniatures in action. The three different scaled miniatures used ranged from a 20 inch model at the smaller end of the scale right up to an 88 inch wide model for the landing shots. 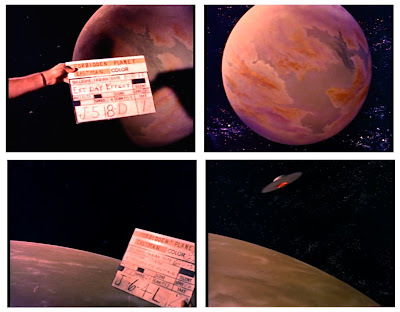 The Altair IV planetoid in miniature with painted backing that works very well in these shots but looks awful in it's alternate full scale soundstage cyclorama in later sequences with the actors largely due to the very dull, flat lighting schemes dictated by director of photography George Folsey. A moodier scheme would have benefitted enormously but MGM weren't that big on that sort of thing preferring instead their patented day glow Natalie Kalmus arrangements most of the time. 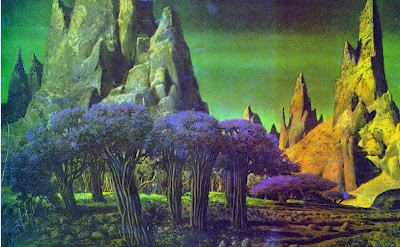 Mentor Huebnor's excellent conceptual water colour painting of both saucer and alien terrain. 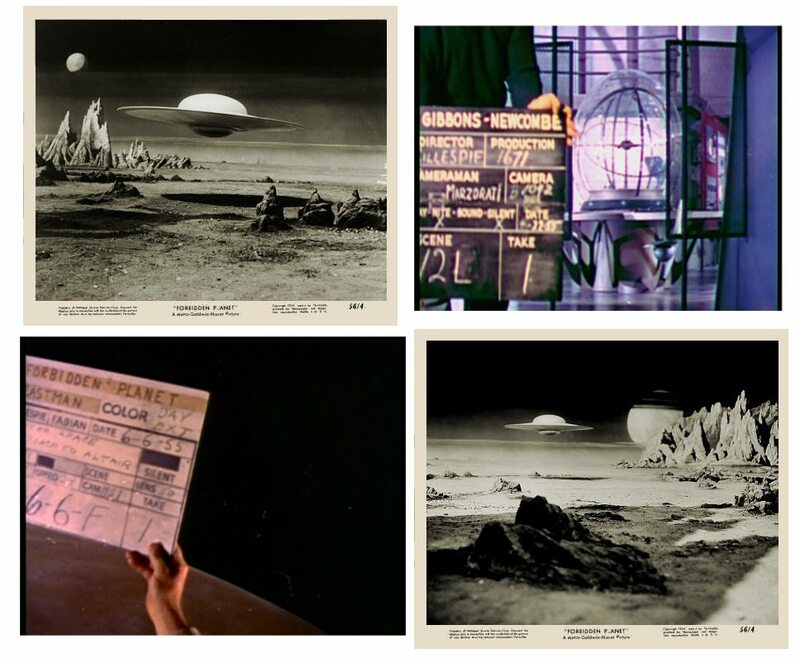 Miniature saucer effects storyboard, possibly by Gillespie himself, or maybe art director Cedric Gibbons? 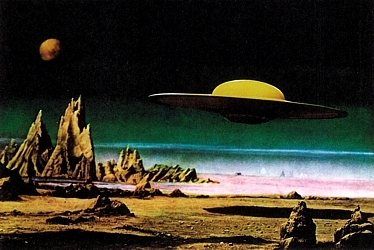 Beautifully understated Irving Ries optical beneath the saucer miniature during landing. 'Let's do the time warp again......' Interestingly, while clearly an optical effect, the slate suggests it to be a Newcombe-Gibbons shot for some reason. 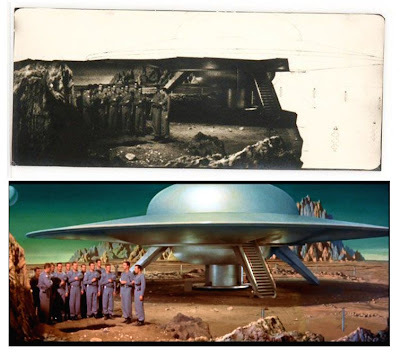 A mundane Irving Ries effect that was overshadowed by a far more creative effect by David Horsley and Frank Tipper in the Universal sci-fi picture THIS ISLAND EARTH around the same time. Foremost matte historian and owner of Matte World Digital had this to say; "Because the soft “glow effect” is from the MGM matte dept. – Matt Yuricich went to school to learn how to use an airbrush just to do this shot (a technique that the dept. didn’t have in the 1950's). – Mark Davis did the composite"
A test frame of what I suppose could be the huge cyclorama painted by studio scenic artist George Gibson - which at least looks somewhat better in black and white. A close view of the Gillespie miniature terrain and painted backing actually shot in full daylight out on the lot. The first Newcombe matte painted shot in the film, in this example by Henri Hillinick - and the least visible. Only when comparing the original matted studio plate above can we appreciate just how much of the shot is painted and quite flawlessly blended in. General articles on the effects of this film suggest that just the top half of the saucer was painted in, whereas now it can be shown that not only the saucer but all of the right side of the scenery is in fact matte art. 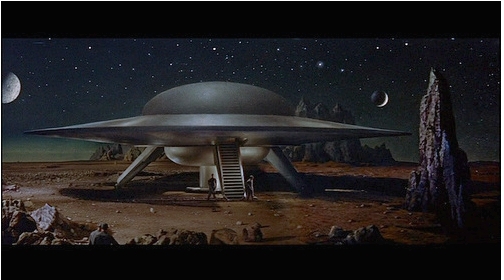 The fairly minimal saucer exterior constructed on the soundstage. Stuntman Frankie Darrow inside the Bob Kinoshita designed Robbie suit, posing with cast and technicians. Conceptual sketch and final matte painting with water element doubled in, showing the intergalactic ranch of Walter Pigeon and Anne Francis. This, as with most of the mattes, was painted by Henri Hillinick as the other two matte artists, Matt Yuricich and Howard Fisher already had their hands full with two other major paintings. The first encounter with Anne's tiger isn't as daring as one might suspect. Both animal and human were shot separately on the same set and optically combined by Irving Ries with a soft split screen running just to the screen left of the cat near to Francis. A close look at the above third frame will show his body partially become transparent as he moves into the split, likewise his head in the second frame. In the subsequent cut a new and occasionally visible moving split screen accompanies the beast as it walks off set, being followed by a quite safe Anne Francis. Henry Hillinick's full frame painting looking beyond the homestead to the graveyard. This matte still survives today. Hillinick's protege Matthew Yuricich liked and adopted Henri's technique of using a razor blade to make a “skip like texture” for the rocks. 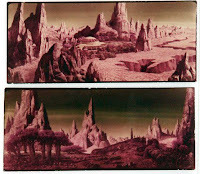 The roster of matte painted shots on the show numbered just five, with Hillinick tackling the bulk of these by far - two views of the saucer and planetscape surrounds, Morbius's house and surrounds and this graveyard view. 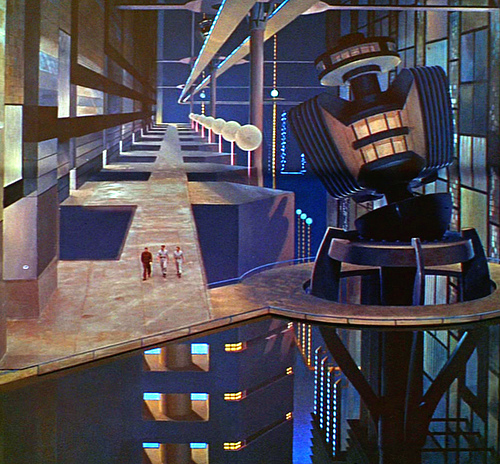 Howard Fisher was left with the large and complex Krell power plant painting which is shown below, while matte assistant Matt Yuricich was largely carrying out gag animation overlays and matte lighting effects. Close detail from part of Henri Hillinick's graveyard matte painting. The second encounter with the tiger is for the most part handled with blatantly cartoony effects cell animation, possibly overseen by Joshua Meador or I'd imagine more likely handled in house by effects animator Dwight Carlisle in the Ries optical department. 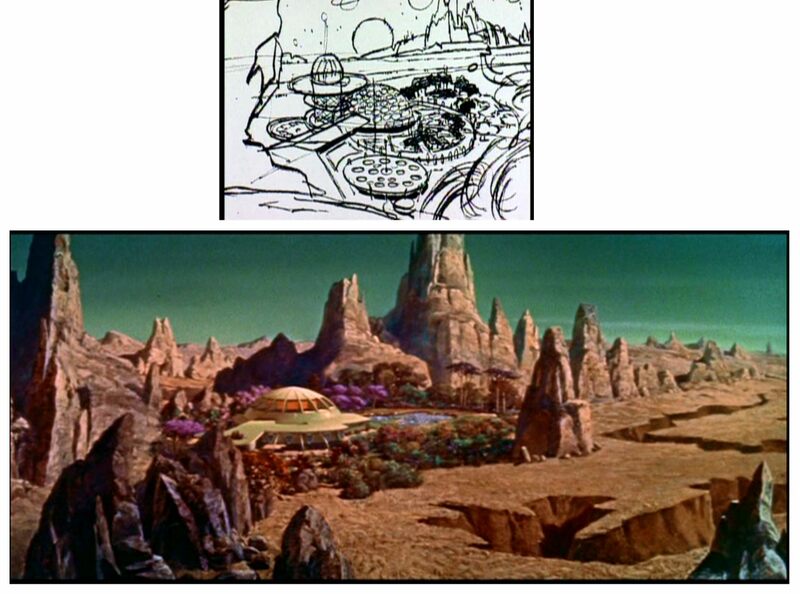 I suspect too that the shot is augmented with a Newcombe matte painting, possibly extending the tree height at left. 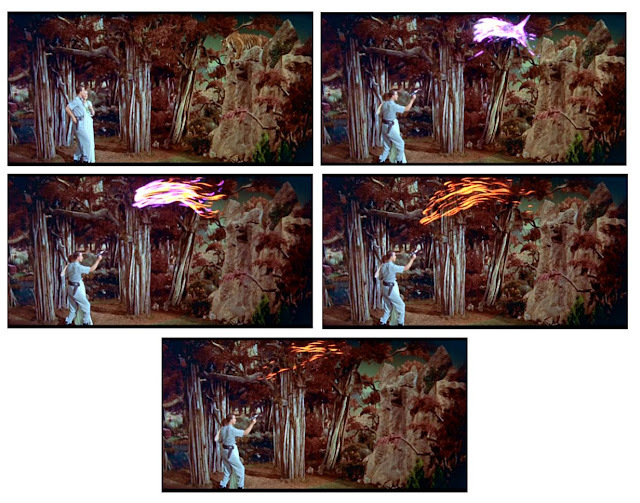 Animator Joe Alves worked on many of these shots as well as the fire animation effects for DeMille's TEN COMMANDMENTS that same year. Later Alves became well known as an art director for shows such as JAWS (1975). 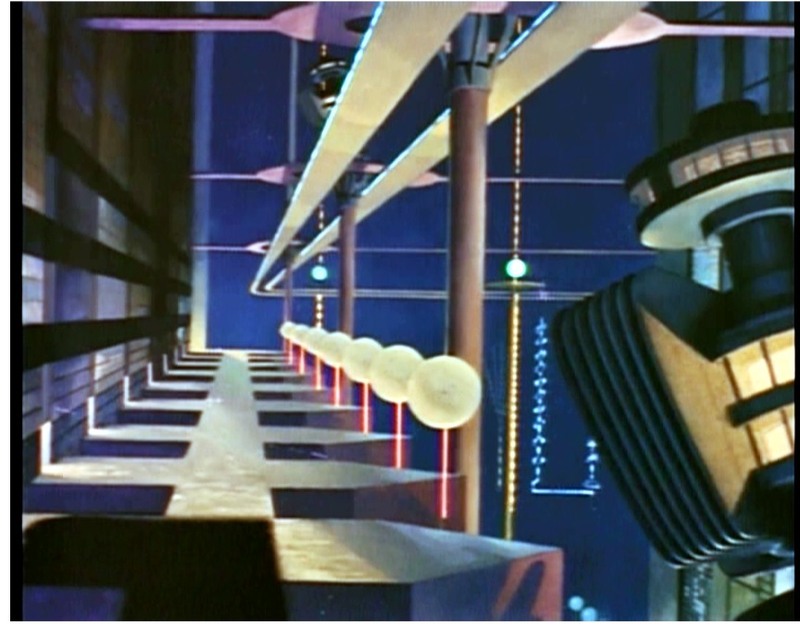 In what is undoubtedly the key effects sequence in the film, the tour through the gigantic underground Krell reactor, the film's creator and conceptualist Irving Block painted this vivid oil sketch as a guide to the Newcombe department. One of the shots that has stuck with me for decades after first seeing this in the late 70's was the truly amazing spiral camera move over the abyss with the working machinery and tiny guests on the bridge. Incredible! The miniature set was some 30 feet high and 10 feet in width at the top, erected on it's side for ease of operation, with a far wider than normal lens was used in shooting the set to stretch the depth as much as possible ......and it's in CinemaScope too!! - which was very unusual in those times whereby most miniatures suffered badly at the hands of lens of far to long a focal length. Effects man David Stipes told me of one of the occasions he and Matt Yuricich worked together whereby Matt pointed out the pool of blue blinking light seen here above the actors to help clarify the otherwise difficult to see live action component, which apparently in early test viewings were hard to see. This airbrushed animated overlay of pulsating, concentric circles of light was Matthew's idea and upon consultation with departmental head Warren Newcombe, Yuricich was given the 'green light' - or in this case the 'blue light' to go ahead and bring the elements to life - a trick that he and legions of subsequent matte painters then adopted in many matte shots over the years such as Mike Pangrazio at ILM using this very same trick for RETURN OF THE JEDI and RAIDERS OF THE LOST ARK as well as Matthew himself using it for a problematic matte in BLADERUNNER where a key character simply got lost in the vastness of the visual effects shot. Howard Fisher's matte with a number of backlit coloured gel gags and animation - all composited as a tilt down shot. 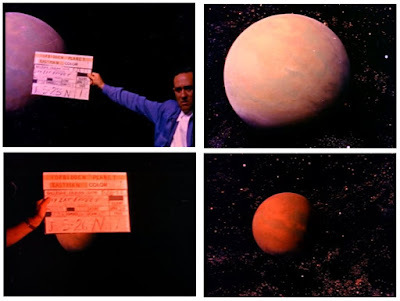 A non anamorphic frame (presumably the painting was shot flat and later optically converted to Scope for the 35mm release internegatives) showing the black matte area before the elements were combined. A frame from an unused take where the actors return to the bridge. In this frame more detail is seen of Fisher's art. Fisher's iconic artwork measured some 48 inches square and was painted on thin masonite, as in fact most MGM mattes tended to be at that time. A separate black matte board with carefully drilled out tiny holes solely for the purposes of producing backlit light effects was also prepared, possibly by Yuricich, and later double exposed over the otherwise 'flat' and gag free Fisher painting, with these composited elements in registration then combined with an optical printer tilt down by Irving Ries to very memorable effect. One of the Cedric Gibbons pre-production sketches which was a guide to the matte department. 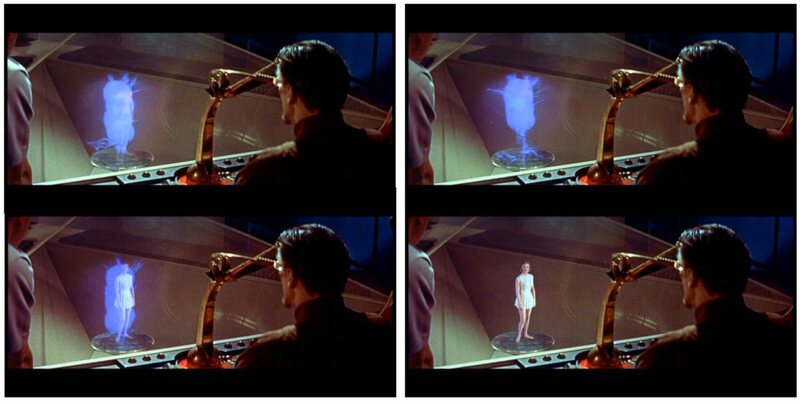 Irving Ries' Princess Leia shot which I'm sure one George Lucas borrowed for his little film. 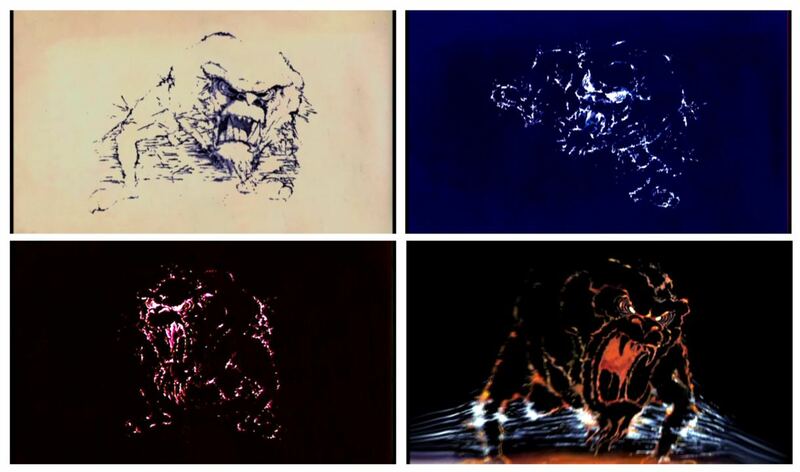 Before and after frames from the infamous 'monster from the id' sequence which necessitated the loan of animator Joshua Meador from Disney Studios to design and execute the desired effect. A sequence that divides most fans - and one I see as beautiful effects animation of a basically very badly designed monster who looks more like a grumpy bulldog than a terrifying behemoth. At left are the plate frames with stuntman on wires, while at right is the finished comp which, aside from the look of the creature, is great! A few years later Meador created some genuinely terrifying animated visions for, of all films, the Disney family show DARBY O'GILL AND THE LITTLE PEOPLE (1959). Joshua Meador's original artwork looks a little too Tex Avery for my tastes. "The Id Monster was a backlit art animation process – Meador's white animation paper with black ink was shot on hi-con film, to make it a element of clear artwork on a black field. Color gels and diffusion were used for different passes to complete the effect". 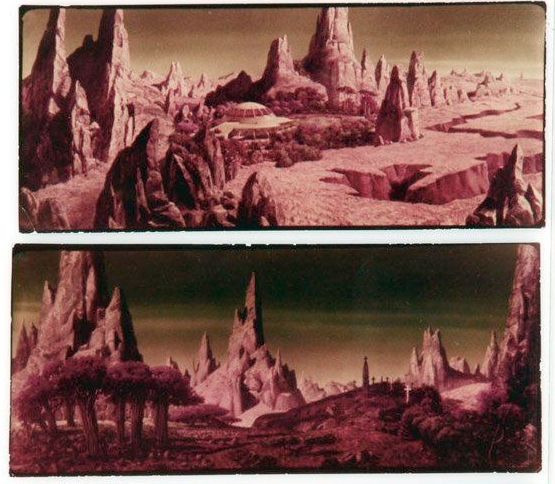 An evening effect of the similar invisible split screen matte painting seen earlier in this article. All's well that ends well.. or something like that. She: "my whole world is gone...surely you can't be serious" He: "I am serious....and don't call me Shirley"
The trailer........ 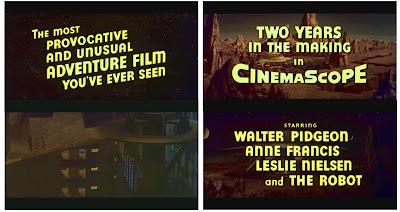 I love these old time trailers... an envigourating artform all of their own. 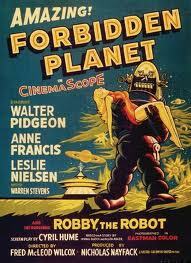 Now, I did say at the start of this blog that I had my own pet theory as to the origins of FORBIDDEN PLANET. Some say William Shakespeare, others say Irving Block .... well I've come to the (arguably off the wall) conclusion that in fact it was none other than Chuck Jones whom I 'd like to think of as the unheralded motivation behind this film. 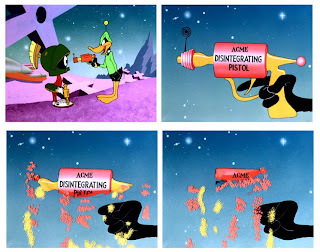 Just take a look at some frames here from one of my all time favourite Warner Bros cartoons, the remarkable and utterly brilliant DUCK DODGERS IN THE 24th AND A HALF CENTURY" which Chuck produced in 1953 and tell me you don't see a dozen similarities. 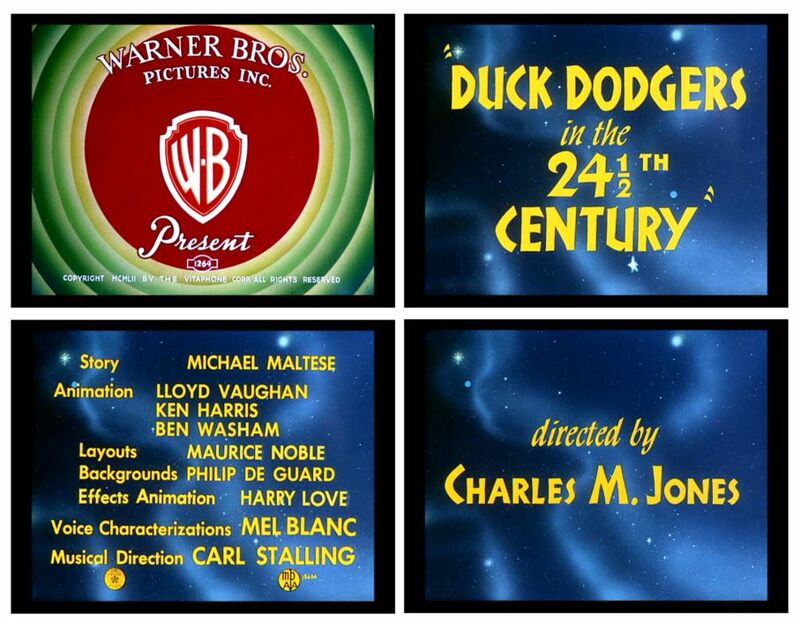 Chuck Jones was a true visionary, and his timeless Looney Tunes and Merrie Melodies are as side splittingly hilarious today as they were in the fifties (the peak of all good cartoons). 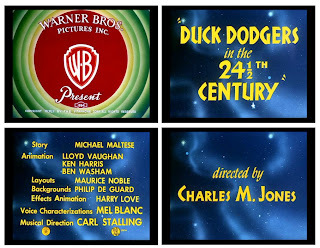 I simply can't watch the MGM feature without seeing those wonderful , timeless Maurice Noble and Philip DeGuard Looney Tune backgrounds everywhere, and likewise, when viewing this Daffy Duck Looney Tune (which I must have seen 100 times) I keep expecting to see Leslie Nielsen and Walter Pidgeon arguing over the unstoppable power of the 'id'. I fully expect to lose whatever thin veil of credibility I might have by writing this jarring quasi-critical post script, which is bound to upset the natural order of film analysis by a tall order, but hey, it's my damned blog so chill out and 'nod' in feigned semi-agreement and rest assured the straight jacket is indeed a snug fit. Time for my medications. 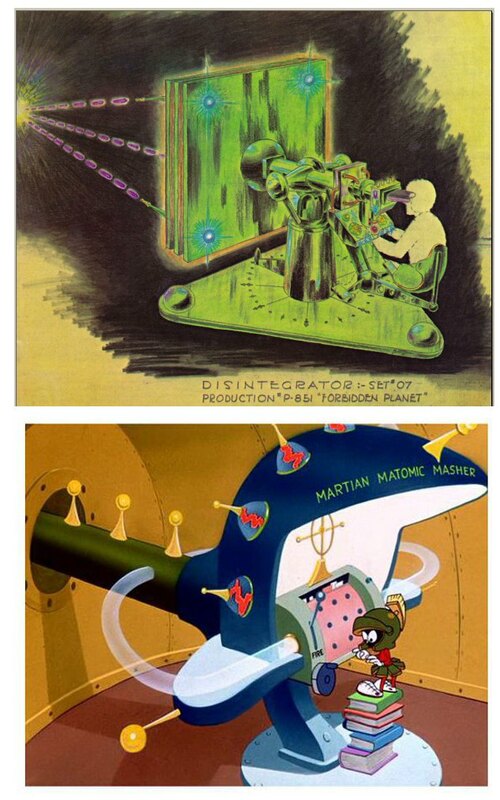 Chuck Jones intergalactic hardware versus Cedric Gibbons space guns... I know which I'd trust in a tight squeeze: "This is MY disintegrating pistol, and brother, when it disintegrates, it really disintegrates......................Well, whataya know, it disintegrated". Now you look me square in the eye and tell me this ain't the same movie!!! 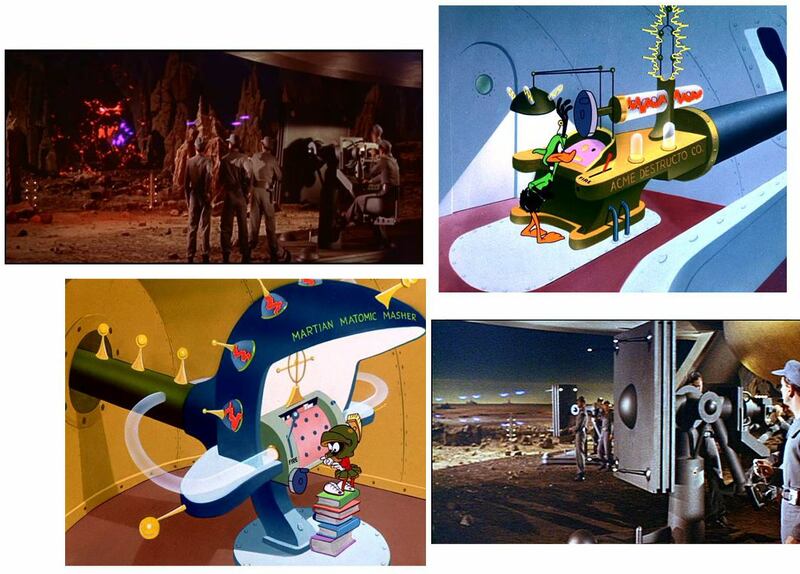 Chuck Jones' FORBIDDEN PLANET....... now that does have a ring to it, me thinks. Great write-up on a classic movie that I really need to re-watch. Let me also take this time to offer my condolences on the devastation in Christchurch. My wife and I had the opportunity to visit this beautiful city about one year ago during a wonderful tour of New Zealand. This and the unfolding tragedy in Japan truly stagger the imagination. On a happier note, I'll look forward to the Thirty Seconds Over Tokyo article, a favourite movie of mine as well. Thank you for those kind comments. Yep, the world, or at least the Pacific rim is in an upheaval for sure, with the Japanese situation unlike ANYTHING I've ever seen in all my years! I was wondering about holding back on the 30 SECONDS tribute due to the situation in Japan? Will considder it and possibly go ahead in a few days. The irony of a post about bombing Japan wasn't lost on me, but I think that we can all appreciate that it wouldn't be a cheap shot. Of course, the movie is 70 years old, so waiting a few weeks extra out of respect is not too much to ask either. The earthquake/tsunami/meltdown situation in Japan is definitely one for the history books. I wish I lived in slightly less interesting times. You are certainly a maniac for detail. I would have killed someone to see this stuff forty years ago! Congratulations on a terrific job. I recall reading that the editor was shocked MGM used his "rough cut," an unheard-of last-second budget trim. Good as the movie was, it does suffer. But I guess Gene Roddenberry liked it. I've just come by new info, credits and pictures which I'd not previously seen on FP (thanks to the kindness of one of my reader/followers) and will update that article shortly.... so check it out in a couple of days. Such an inspiration for you to have in posting this photo-detailed article on art. Shakespearean indeed! Actually i didn't like the film that much as I grew up but in recent years found it to be better than I first perceived. Something to do with gettin' old! OK, I'll stop...I once suggested this to a guy who made a living from building full-size Robby replicas , and he was furious. I love it!!!!!! And to think I figured my pet theory to be off the wall, but this is great! So long as you draw inferences to Robby being based on GWTW's Butterfly McQueen though.... trade the "would 80 gallons be sufficient" line for "I don't know nothin' about birthin' no babies" and you'd have one hell of a bizzarre sci fi film! We have got to get jobs writing spoof gags for FAMILY GUY or similar..... this is pure gold. FP is such a layered storyline, both in the script & visually that, for me, it's constantly fascinating - I suppose we gotta thank Will S for that to some extent. Being made in the 50's as it was, there are clever visual digs at the ideal lifestyle, of which Robby is one, being the ultimate home convenience. 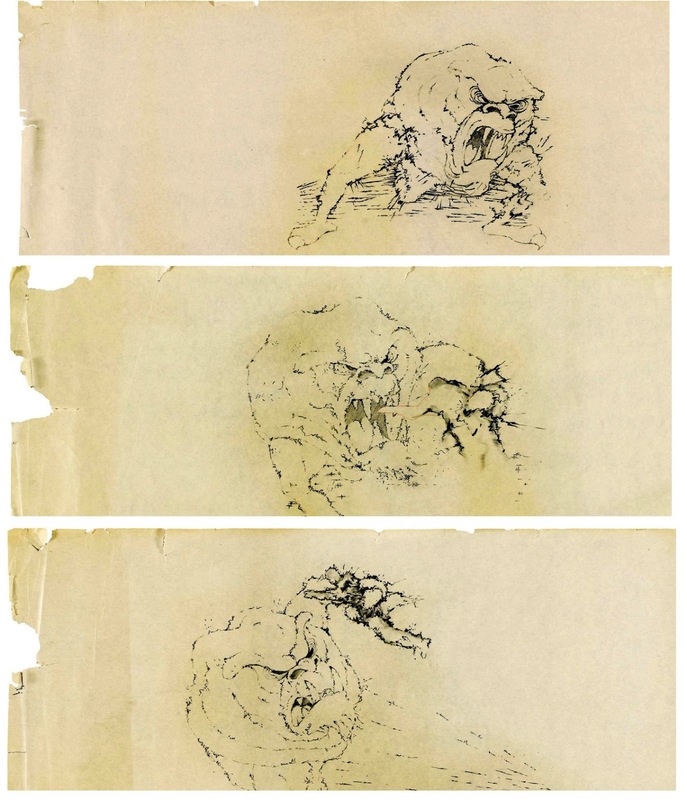 TRIVIA: Assisting Meador sketch the id Monster was none other than designer of "Bruce" the shark, Joe Alves. 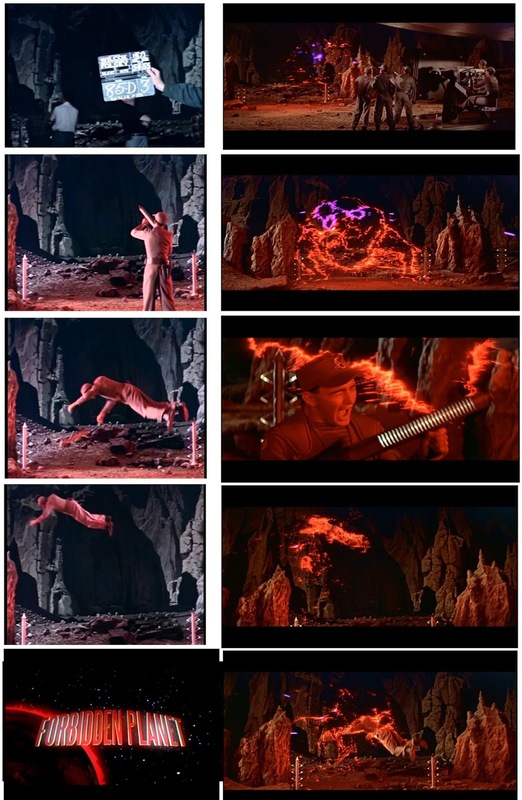 Yep, and that same shark man also animated the flaming whirlwind fx under Fulton at the climax for DeMille's THE TEN COMMANDMENTS. 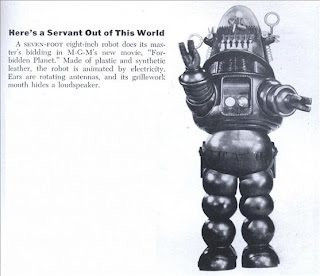 I enjoyed every word of this wonderful essay on Forbidden Planet. The members of my science fiction message board (All Sci-Fi) greatly appreciate the hard work you put into creating this fine article on the greatest science fiction movie ever made. Thanks for the behind the scenes peek at the "magic" in this film. Your enthusiasm and insight are much appreciated. in-depth, comprehensive one I have ever seen. Thanks for that....I try my best with what I have/know. I like to give these shows as good a breakdown as possible and I'm fortunate in having some great contacts in the FX world and some really rare imagery from time to time. Way back in the 1950's Josh Meader worked down the hall from me at the Walt Disney Studios. I remember seeing his pencil drawings of the id monster on his drawing table. I eventually saw the movie and loved it. Cool stuff! Great stuff! This was my favourite film in the 60's 70's but unfortunately I only saw it as a 'cut up' version on weekend afternoon television. Finally bought a DVD of the film a few years ago, and it was the first time I had ever seen the opening scene... in the 'cut up' versions the film started with the sequence where they start orbiting Altair IV. Loved your article! Keep up the great work! So glad you enjoyed it. I'm not sure what's worse - a cut up print or a dreadful 'square' pan & scan transfer where two thirds of the image is chopped off the sides as all old tv prints of widescreen scope films used to be. Do you know who did the artwork for the domestic 1956 one-sheet poster??? Do you know who did the poster artwork for the domestic 1956 theatrical 1-sheet??? I've actually got one of those 1-sheets but, no, I've no idea who did it. Do you know where I could purchase a print of the graveyard matte? Well, not really, though you could always do as I've done and obtain a good BluRay screen grab and have that printed. this is really a great article about the matte art that made FP so wonderful. Congratulations and many thanks for that! I've only found one little mistake in the article: The name of one of the matte artists of this film is Henri Hillinck, not Hillinick. And by the way: I'm not sure that you're on the right track with your pet theory about the connection of FP with the Duck Dodgers animation film. In my eyes there are none. 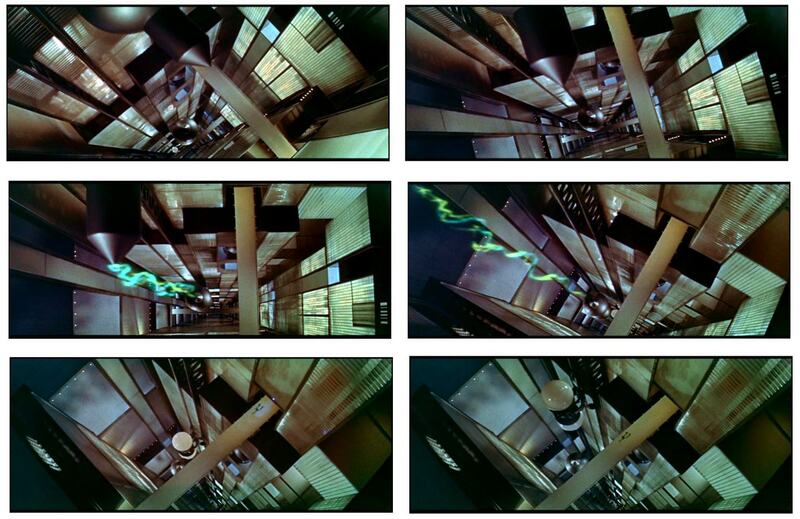 I've been trying to figure out how the Krell city FX were made since I was a child in the 70s. I am very pleased to learn that the process was as ingenious and technically sophisticated as I imagined it had to be. It still has that wow factor! Thank you, an excellent read! A Arnold Gillespie was my grandfather. I love seeing these articles on his work. He was truly a legend. Thank you.